My youngest daughter loves history. Her dream is to one day be a middle or high school history teacher, so she can share all about the amazing people she has been learning about, along with their work. It is weird having a child so into history like she is, as history was one of my least favorite subjects in school. :-) But, I am finding that through her love of history and learning all about events, people and places, that I am learning all over again. And, now that I am older, I guess I am appreciating what I am learning, and find it fascinating, and can see how people like Alexander Graham Bell have been crucial in shaping our country with their inventions. Recently, we were sent "Alexander Graham Bell for Kids: His Life and Inventions, with 21 Activities" by Mary Kay Carson. This book was released back in June, and has 144 pages, filled with fun facts, photographs, and more all about this famous inventor. 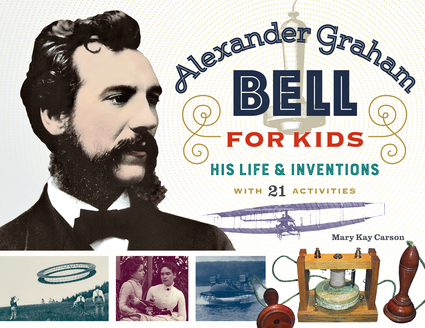 What I loved about this book, like the two previous IPG Books I just shared a review on (the NYC and Boston History for Kids books) is that this one also comes with 21 hands-on activities that make learning about Alexander Graham Bell that much more fun. Both of my girls are hands-on learners, and have really taken to these types of books. Alexander Graham Bell invented not only the telephone, but also early versions of the phonograph, the metal detector, airplanes, and hydrofoil boats. This Scottish immigrant was also a pioneering speech teacher and a champion of educating those with hearing impairments, work he felt was his most important contribution to society. This unique biography includes a time line, a list of online resources, and 21 engaging hands-on activities to better appreciate Bell's remarkable accomplishments. "